Unfinished wood tops may have an oil or wax coating and sometimes marks can be removed from them by removing the coating itself. This is called a sacrificial effect; the wax, which can be replaced, is removed in order to remove the blemish or stain sitting on it. In this case, you would use a solvent for wax or oil, perhaps ammonia diluted with water and a light abrasive – for instance, a cleaning cloth. It should be noted that in this case, as in many others, the cleaning cloth is fulfilling several functions at once. It is a vehicle to carry and apply the solvent, also an abrasive, and at the same time acts as a device for capturing the softened substances. Another example which works in a very similar way, would be steel wool or the scratch pads that we use to wash dishes. In the case of the scratch pad, there are again several functions all combined in one material. The scratch pad acts as an abrasive, as an applicator of the soapy water, and as a capturing device to collect the dirt removed from the dishes. Understanding this simple fact will help a great deal when confronting a stain or blemish. For the table top, you need to know what kind of blemish you are dealing with and the durability of the underlying surface. In the case of the unfinished table top mentioned above, many marks might be effectively removed using another sacrificial technique, namely sanding the surface down until the stain is removed with the wood that is taken away by the sandpaper. If removing scratches or chemical stains on a varnished table top, it might be necessary to remove the varnish in order to remove the mark. Obviously, this might mean removing all the varnish on a continuous surface to avoid an uneven appearance once refinished. 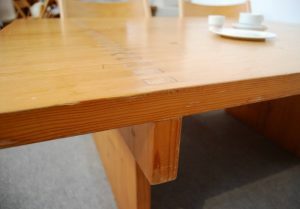 It is not usually desirable to remove varnish from a table top with sandpaper, although it is possible, as this will often result in altering slightly the ultimate appearance of the surface. It is hard to remove all the varnish without taking away a lot of wood. 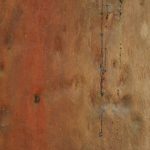 This is because varnishes, paints and oils can penetrate quite deeply into a wood surface and may not be visible after a sanding, but may still be present, only to reappear when another application of varnish is applied. This will often result in an uneven appearance and an undesirable look when dry. Quick tip: In order to test for unseen remnants of varnish after sanding, wiping with a cloth loaded with rubbing alcohol, which will wet the surface long enough to show signs of hard elements (dried varnish) in the pores of the wood. In most cases, the rubbing alcohol will evaporate quickly with no trace or staining of the surface, which might occur if using water. •	Determine the type and nature of the substances to be removed. •	Test them with an appropriate solvent. •	Verify that the underlying surface is resistant. •	If necessary, use an abrasive to loosen the softened substance. •	Wipe clean with a clean cloth. It is usually advisable to use solvents in diluted form at first, and reduce or increase the dilution, if needed. Most household cleaners can be diluted with water at no risk. Note: Some types of wood contain acids and other chemicals that will react and stain in the presence of the metal in steel wool. Test before use on bare wood. If it becomes necessary to remove all the varnish on a table top, the best method is usually to reduce the hardened varnish with acetone. Do this with the surface in a vertical position so that the acetone will run down and off the surface. Paint it on with a brush and let it wash the diluted varnish or paint off the surface. Acetone maybe diluted with alcohol it needed. Wear a respirator and do the work in a space with plenty of ventilation. Also, keep skin and cloths away from contact. Using acetone has the advantage of not discoloring the wood surface or opening the grain of the underlying wood surface. Make sure to remove all traces of the cleaner with alcohol before refinishing to avoid any possible reaction to the new application of varnish. There are two important exceptions to the general rules outlined above. These are shellac and French polish, which are both alcohol based and not often used on furniture these days BUT, if they are, they will break all the normal rules. Without going into it too deeply, there are two main things to be aware of. First, any application of polyurethane, or any polyurethane based product, on top of shellac or sometimes French polish, will turn milky white, which will be quite a shock when it happens. There is, as far as I know, no remedy, other than complete removal. The other wild card is water staining (usually white) on French polish, which is quick to occur and difficult to remove if you are unaware of the remedy. To fix it, reapply more French polish over the top of the stains, traditionally done with small circular motions using a tightly balled-up cloth called a rubber. French polish with a dark tint can also be used to fill in surface scratches in more common dark wood finishes and is sold commercially as “scratch cover” for this purpose.